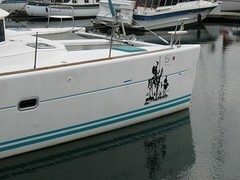 Today, the graphics folks snuck into the marina and slapped a decal on our boat. Actually, two decals, a home port, and the boat name. To be fair, we paid someone to do this. We were originally going to do it ourselves, but as we near departure day, the "time versus money" trade off becomes daily more acute. The thought of taking possession of the graphics in a rolled up tube and sticking them in a locker somewhere -- only to pull them out 3 years later when we move off the boat -- was not to be considered. Our boat is now officially "branded." While a quick Google search on the term branding yields a wealth of fascinating definitions, my personal favorite is from MediaLit: "The process by which a commodity in the marketplace is known primarily for the image it projects rather than any actual quality." Quixotically, that strikes me as particularly appropriate. The image Dr C insisted on and the girls seconded with enthusiastic acclaim is one of historic value and known cultural value. This image is projected in complete disregard for the filthy, fun loving, and ridiculously crude family it now represents. Quixotic, however, is another word with which I am acquainting myself. To be quixotic is to be "not sensible about practical matters, idealistic and unrealistic." At just three weeks remaining before our departure from familiar stomping grounds, it is hard to believe that we did not name this boat ourselves. Dame Fate delivered s/v Don Quixote into our hands, apparently having a good sense of humor and a pretty good ability to predict the future. 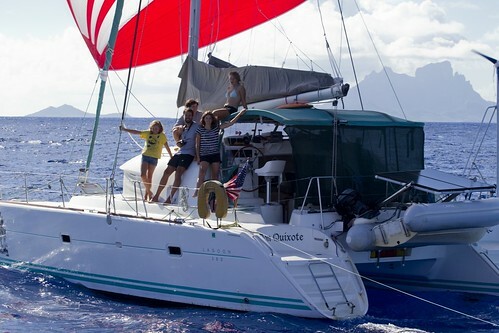 Finally, we look at her transoms on which we proudly name her s/v Don Quixote (a truth!) while simultaneously advertising our home port as Vancouver, BC (a lie!). Why? Because rogue waves, alligators, and pirates terrify my family considerably less than being recognized by complete strangers as Americans from a distance of up to half a mile. We strongly considered using the home port Tranquility Base, Luna, but unfortunately it didn't fit. It turns out, you can literally put anything on your boat as a home port. There appear to be no rules. As long as we continue to carry our US Coast Guard documentation, numbers, registration, etc. and our WA 2008 property tax sticker, we're legal even if we put Ratchet, Kalimdor. That too is probably too long, by the way so don't get excited. However, the most seriously paradoxical aspect of all this new and shiny logoish goodness is that the area where the decal was applied is the only clean white spot on the entire boat. I look at good ole DQ and Sancho up there and all my inner child sees is a 3 foot sign scripted in Comic Sans screaming, "WASH ME!" I really enjoy your blog, and can't wait until you take off. I'm not sure if the BC home port will fool anyone you really want to fool, especiallly since you still are sposed to fly a US flag. My boat's home port said OMAK, WA and it took two years and reaching Turkey before we even found an American who knew where that was. Yep. We're documented. And yep, we probably screwed the pooch, but we ordered these damn things nearly a year ago. I'd almost forgotten. It's been a long and educational year. We'll probably just scrape off the BC and register in Vancouver, WA next time it comes due which is... come to think of it... in August. We've seen a lot of boats go out without the state so that shouldn't be a problem and will accomplish the same objective. Though as Casey noted, we're not fooling anyone. Where this family gets these ideas I do not know. Sometimes I think we just collectively pull them out of our ears on a dark night. We're a live aboard family and the most logical logo I can think of for our catamaran would be a glow in the dark radiation warning marker. It's impossible to keep that much square footage looking decent.